New York, New York : Penguin Books, 2009, c2008..
274 p.,  p. of plates : ill.., ports. ; 22 cm. Beginning in a jail cell and ending in a rugby tournament--the true story of how the most inspiring charm offensive in history brought South Africa together. After being released from prison and winning South Africa's first free election, Nelson Mandela presided over a country still deeply divided by fifty years of apartheid. His plan was ambitious if not far-fetched: use the national rugby team, the Springboks--long an embodiment of white-supremacist rule--to embody and engage a new South Africa as they prepared to host the 1995 World Cup. The string of wins that followed not only defied the odds, but capped Mandela's miraculous effort to bring South Africans together again in a hard-won, enduring bond. 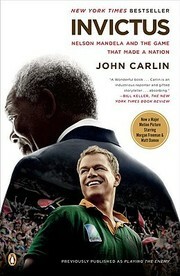 Invictus : Nelson Mandela and the game that made a nation / John Carlin. Reprint. Originally published : Playing the enemy. New York : Penguin Press, 2008. "Now a major motion picture starring Morgan Freeman & Matt Damon" -- Cover. Include bibliographical references (p. ) and index. Rugby Union football--Political aspects--South Africa. 240 UniformTitle 10 $a Uniform title Playing the enemy. $c Statement of responsibility John Carlin. $c Date of publication, dist, etc 2009, c2008..
263 ProjectdPublish $a Projected publication date 200911. 500 General Note $a General note Reprint. Originally published : Playing the enemy. New York : Penguin Press, 2008. 500 General Note $a General note Movie tie-in. 500 General Note $a General note "Now a major motion picture starring Morgan Freeman & Matt Damon" -- Cover. 504 BibliogrphyNote $a Bibliography, etc. note Include bibliographical references (p. ) and index. 505 ContentsNote 0 $a Formatted contents note Breakfast in Houghton -- The Minister of Justice -- Separate amenities -- Bagging the croc -- Different planets -- Ayatollah Mandela -- The Tiger King -- The mask -- The Bitter-enders -- Romancing the general -- Address their hearts -- The Captain and the President -- Springbok serenade -- Silvermine -- Doubting Thomases -- The Number Six Jersey -- Nelson ! Nelson! -- Blood in the throat -- Love thine enemy. $z Geographic subdivision South Africa. Accelerated Reader ® Renaissance Learning, Inc.
You have been inactive for 0 minutes. Safari is about to clear your search results and reset to protect your privacy.